The Enviro Empress pellet stove is derived from the Empress freestanding pellet stove, but there are a number of important differences. A more efficient cast iron heat exchanger has been included to save space. The convection blower has been uprated from 105 cfm. to 160 cfm. It's a cast iron pellet fireplace that appears more like a traditional fire. The cast iron doors open revealing a large viewing window to further enhance this look. Inside is a set of cast iron brick effect liners. The cast iron surround has an attractive arch design. This insert is available in three colours; 2 Porcelain Enamel - Diamond Black and Antique Chestnut. Also available in a matte black painted finish. The hopper size is adjustable to fit smaller fireplace openings. Advanced glass air wash system to keep the glass cleaner. The surround clips on and off to give easy access for maintenance. The Enviro Empress is thermostat ready and compatible with remote control. Max. Heat Output 34,000 btu. Depth into fireplace 15 in. Width: front 30.75 in., back 21 in. Height 30 in. Width 42 in. Window Size 16 in. by 10 in. Rear Vent Height 7.5 in. Reducing the hopper size of the Enviro Empress insert to fit a smaller fireplace will reduce the maximum burn time. The vent system is easy to disconnect for maintenance. 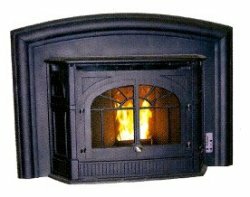 If you would like to leave a review of the Enviro Empress fireplace insert, please use the form on the contact page.